An international audience listened to a variety of social, political, security, linguistic, historical and cultural perspectives at “On the Outside Looking In: A Kurdish Studies Conference,” a day-long forum hosted by the University of Central Florida Jan. 27. It was the first in a pair of collaborative, interdisciplinary conferences organized by Soran University and UCF. Soran University is a public institution located in the Soran District of the Kurdistan Region in Iraq. Muslih Mustafa, President of Soran University, opened the forum by highlighting the growing relationship between his institution and UCF. Nahro Zagros, Vice President of Soran University and a key player in organizing the conference, also shared welcoming words. John C. Bersia, Special Assistant to the President for Global Perspectives, noted in his comments how closely the forum coincided with the one-year anniversary of the partnership between UCF and Soran. The final part of the opening featured a talk by Michael Gunter of Tennessee Tech University on the history of Kurdish Studies in the United States. The day’s activities resonated in a special way for an honored guest, Tyler Fisher, UCF’s first Rhodes Scholar. Fisher – who currently calls University College London and Lady Margaret Hall, University of Oxford home – also traveled from abroad to help organize and facilitate the conference. He was excited to be back at UCF for such an occasion, particularly in that the event provided a venue for presenters to share research on important ideas designed to promote creative thinking and increase communication. The wide array of topics covered by the speakers allowed attendees the opportunity to have a ‘look in’ on pressing Kurdish issues without actually having to visit the region. In the first presentation, Kamal Y. Odisho and Muslih Mustafa, both of Soran University, discussed “The Exodus of Christian and Aramaic Peoples from Mesopotamia: A Last Safe Haven in Kurdistan?” Afterward, audience members had an opportunity to ask questions and offer comments, as they did throughout the day. 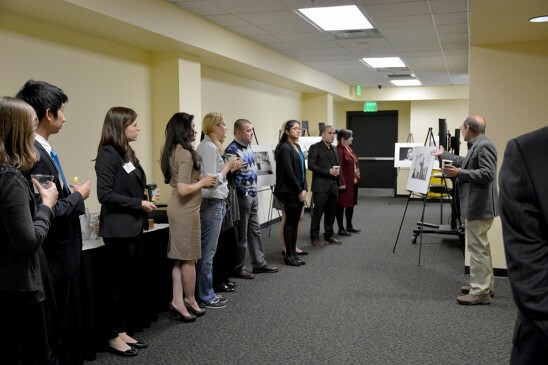 Conference attendees then had an opportunity to view an interactive exhibit of black and white photos titled “What We Lost in Sinjar,” by photographer Robert Leutheuser, who was on hand to discuss his work. The conference concluded with a dinner address from Steven A. Cook, Hasib Shabbagh Fellow for Middle East Studies at the Council on Foreign Relations. Cook’s talk was on “Kurdistan, Iraq and the Emerging Middle East.” His participation was made possible by the Prince Mohammad Bin Fahd Program for Strategic Research and Studies at UCF. Further information about conference presenters and their abstracts may be found at http://ucfglobalperspectives.org.